Now that we are back from the Memorial day long weekend, does anyone else feel like we've kicked off summer? I know that summer doesn't begin officially until June 21, but I am already in the spirit. It might seem strange to "be in the spirit" since I'm living in Austin, Texas and we get temperatures up to 95-99 degrees Fahrenheit (35 to 37 degrees Celsius). But I think as a Canadian, I've been programmed to believe summer is fun. Heat is FUN darn it! I mean what is really to complain about? We've got AC, water parks, and LaCroix to keep us cool. The first thing we need to do is install and load all required packages for our summertime fun work with R. These are all of the install.packages() and library() commands below. Note that some packages can be installed directly via CRAN and some need to be installed from github via the devtools package. I wrote a blog on navigating various R package install issues here. We then download the data set from my github profile through the fread() function. We can then create a few helper date columns which make it easier to display in the graph. Next, we want to create our graph which plots the FIZZ stock price over time. To give the graph a more appropriate LaCroix style flair, we will employ the employ the LaCroixColoR package. We will call on the lacroix_palette function when assigning the colors through the scale_color_manual function in ggplot 2. 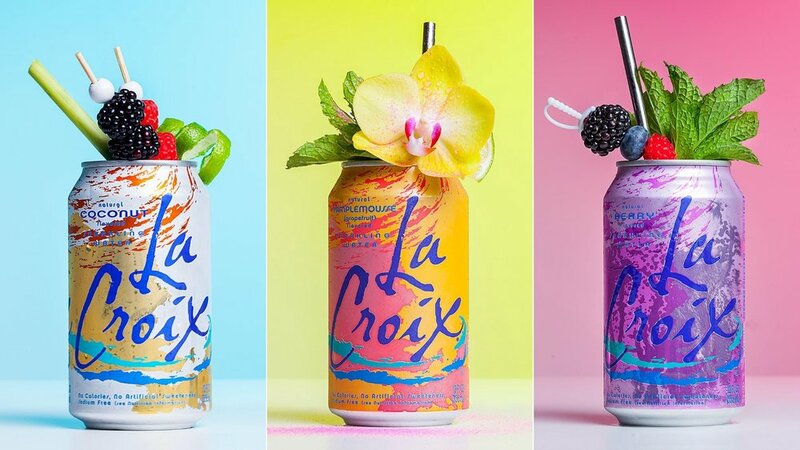 When calling the lacroix_palette function, we need to specify a flavor and of course I picked my favorite flavor: Peach Pear! Now it's time to inject even more fun into these graphs - ANIMATIONS! In case you are wondering, yes this is the most important thing to spend your time doing. Come on this is fun! Who doesn't want to have a cartoon character climbing their graph? Or have Vincent Vega pointing at your x-axis? This type of activity is known as data nerd humor, or graph comedy. In this blog, we are breaking the graph into three parts of the stock journey and adding an animation for each phase: initial stock climb, climbing the mountain and the sad decline. For this image, I wanted to bring in a sticker with a lot of zest! This lucky guy just realized his stock is climbing. He is stoked and doing a happy dance. For this image, I wanted to bring in a sticker with an earned sense of confidence. This stock climb is steep but the little buddy is sticking with it. He deserves to give a triumphant wave. For this image, I wanted to bring in a sticker that reflects the sad realization of a stock hitting somewhat of a free fall. I am doing my part to boost the LaCroix stock prices, but I'm only one woman. And therefore, we need a crying cat at the end of this curve to reflect the cooling off of stock prices in 2017/2018. Thanks for reading along while we took a silly little journey through LaCroix stock prices, the LaCroixColoR package and Magick animations. Please feel free to let me know your thoughts in the comments or on twitter.